Palmia Observatory: How Northern Lights might make sounds; Plasmons, Batteries, Computer Memory and Temperature with STEM; Has the EHT photographed a Black Hole? How Northern Lights might make sounds; Plasmons, Batteries, Computer Memory and Temperature with STEM; Has the EHT photographed a Black Hole? 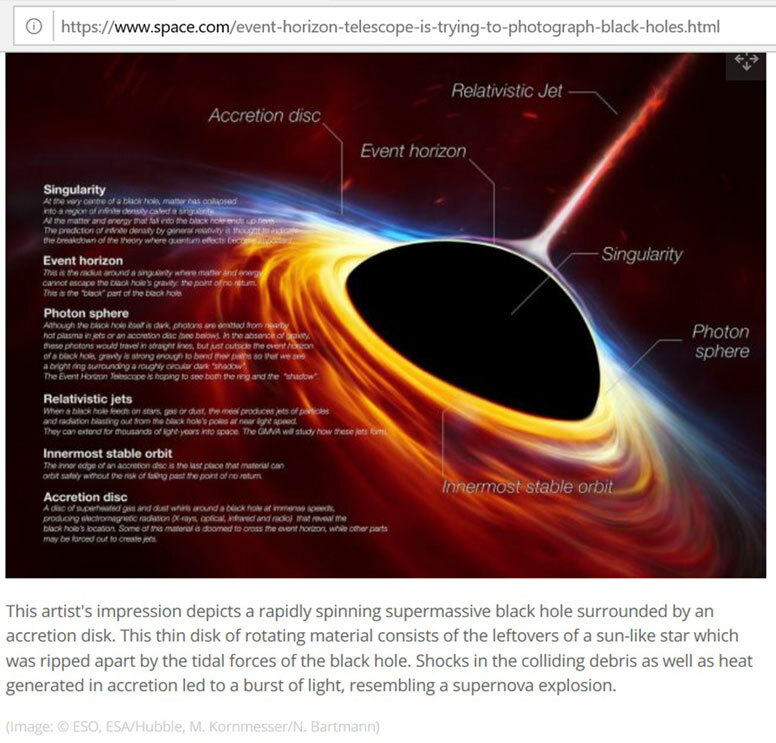 Well here we are packing our bags for the upcoming April APS meeting in Denver but we can report on some of the events of this week and check the incoming mail, which hopefully will have the first photograph of a black hole. First up, our prediction of cloudy weather for the scheduled OCA star party turned out to be wrong but we had to be elsewhere so no nighttime sky observing this week. Those darn clouds can be trouble but we received an email for Pacific Coast Gravity Guy, Ken, commenting about our previous post which included some clouds that we saw that looked like a giant bird in the sky. Well it turns out that many artists have seen cloud birds and have many interpretations over the years and Ken forwarded a reference to an oil painting that he had had hanging in his home for many years. 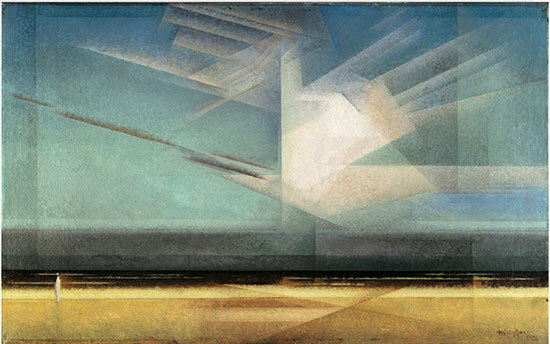 Check out this 1926 oil painting, Bird Cloud, by Lyonel Feininger. Thanks for sharing that, Ken! 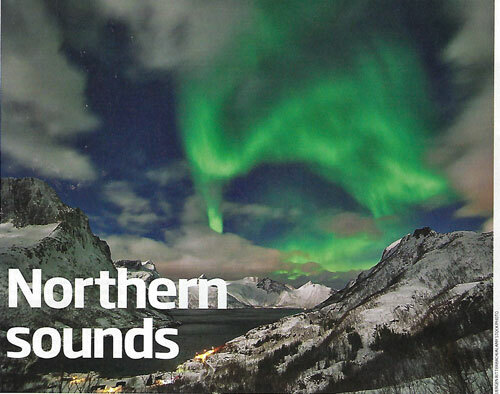 As you know those pesky clouds also interfered with our opportunities to see the northern lights, but now an article, in New Scientist, points out how the myths about also being able to hear the northern lights might be possible. When we were in Norway we heard many stories from the native Sami people that the northern lights often come with a sound. 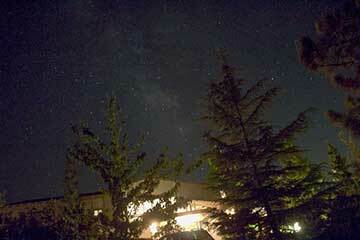 So even though the clouds were blocking any view of the lights, we had no indication at all of any sounds. But since the lights are being generated hundreds of kilometers above the Earth, it was difficult to see how they could generate any sound since there is no air up there. Well, those stories of hearing sounds associated with the northern lights might now have a physical explanation that makes some sense. The April 6, 2019 edition of New Scientist presents an article explaining how it can make sense in terms of physics. So, the article goes on to describe how some sound, generated in the atmosphere, and yet caused by the lights, could be consistent with known physical processes. So we see here since the lights themselves are a result of charged particles from the sun that interact with the Earth's magnetic field and some air molecules in the upper atmosphere. 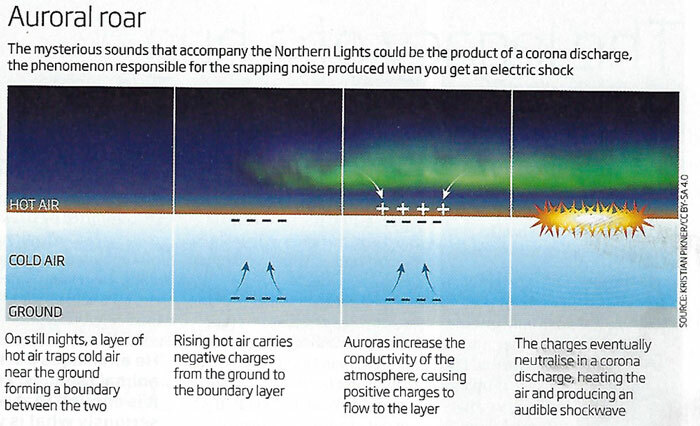 Now if the charges and Earthbound weather conditions are just right, then this new model seems to be able to explain how a sound could be connected with the northern lights Pretty neat! So, even though we did not go out for night observing, there was still many daytime physicist wannabe events. The CSULB physics colloquium was on using scanning transmission electron microscopy (STEM) to make measurements that impact the development of new nano-scale thermometry, new computer memories to keep up with Moore's Law and another application that can see into many chemical processes and dendrite formation that limits the life of new rechargeable batteries. Professor Chris Regan, UCLA, described these techniques and the results of his team's research efforts. STEM can achieve much higher resolution than optical microscopy because the effective wavelength of the electron is something like 100,000 times smaller than visible light wavelengths. 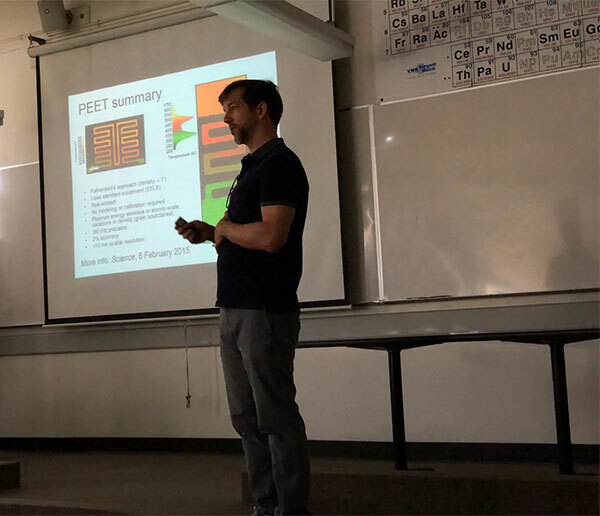 Professor Regan has been working on using STEM to develop high resolution (< 10 nanometers) thermometry, which are summarized as Plasmon Energy Expansion Thermometry (PEET). These high resolution measurements and other STEM based measurement techniques can be used to better understand the performance of new and existing batteries and high speed semiconductors and memories. Now not being versed in condensed matter physics, I left the colloquium with my homework which was to read up on "plasmons", which I had not heard of before. It turns out that plasmons are to plasma as photons are to optical oscillations in light. That is a plasmon is just the term used to described the quantized oscillation in a plasma. So, light is quantized as photons and mechanical vibrations are quantized as phonons and plasma oscillations are quantized as plasmons. Quantum mechanical calculations correlate electrical and mechanical properties of materials with the energy and wavelength of these plasmons. So, they a an important way of explain those properties. The really big astronomical news of the week is the planned news conference from the Event Horizon Telescope collaboration scheduled for April 10. The buzz is that the data collected in 2017 by the 8 radio telescopes, from all around the Earth, has finally collected the first image of a black hole. The collaboration has been busy the last two years doing all the analysis to make sure they understand what the data means. These eight telescope arrays collect so much data that the data communication networks cannot keep up with the need to transfer all of the data to one central computer location where the data can be integrated. The team says that they are forced to transfer the data from each observatory by hard drive and FedEx in lieu of any data communication network. There is just so much data collected that hard drives and FedEx is faster than any fiber data communication network. In addition, the data disks from the South Pole Telescope can only be flown out during the Antarctic summer. Then when the data is all at one central site, the time of arrival at each remote site can be incorporated in the analysis and all eight telescope signals can be time adjusted so that the whole ensemble looks like a giant parabolic antenna the size of the Earth. It takes this large antenna array to see something like a black hole. As big as we think a black hole is, it is really a very, very small part of the galaxy. Wow, has all of the data finally come together and has the analysis and black hole image really finally happened! This space.com article shows many of the details. So you have time to come up to speed, while we are busy twiddling our thumbs waiting for the EHT press release which has, hopefully, the first image of a black hole. NEWS FLASH! National Science Foundation has April 10 News Conference and releases first picture of black hole event horizon! 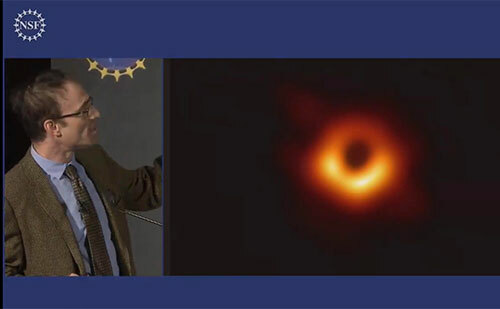 Ok, so now just at the last moment we have some images of the black hole made at the news conference. 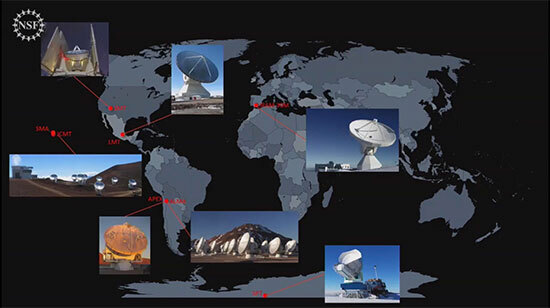 First, here is one of the slides that shows the wide network of radio telescopes used to collect the data in 2017. We think that we have a hard time with weather just interfering with our single observing location, but the EHT has to have good clear weather that does not interfere with the radio reception at seven worldwide locations. But, they say they had 7 good day out of the scheduled 10 days and were able to collect good data. 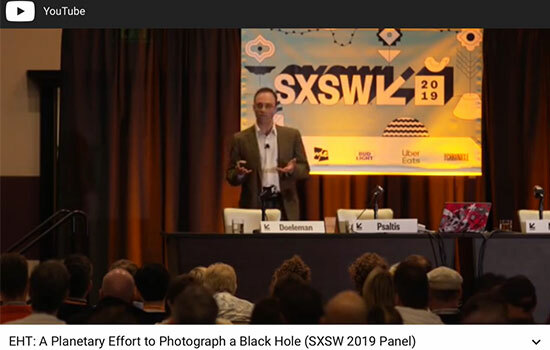 Finally, Shep Doeleman, EHT Director, Center for Astrophysics - Harvard & Smithsonian, showed the final result of data collected in 2017 and analyzed and finally released. They confirmed Einstein General Relativity predictions and confirmed BH mass at about 6.5 billion solar masses. The collaboration has collected data for the black hole at the center of our own Milky Way galaxy but do to additional processing requirements that image is not yet ready for release. Nonetheless, this is a big deal and congratulations to the whole collaboration! So there will be more news releases and further details available in the published papers. In the meantime, we heard that a documentary movie, "Black Hole Hunters:, will be premiered this weekend and should be very interesting to see.